Welcome to our website. Here you will have the ability to travel through our site and learn more about who we are, what we do and how we can help you. 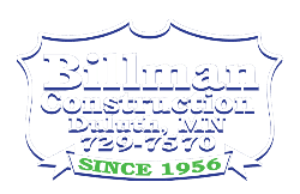 Billman Construction in Duluth, MN has been building custom new home construction for over five decades. We have the knowledge, skill, and integrity to ensure that your new home is built on time, on budget, and up to your standards. We welcome your phone calls and/or e-mails with any questions you might have. For your convenience, we have created our Feedback form that will allow you to tell us about your next project. We look forward to hearing from you and to meet with you and go over your plans. Donn W. Billman the founder of Billman Construction, Inc., & Billman Home Center, began contracting in 1956 with a three-man crew. Currently, Billman employs over 75 people. With construction of over 700 single-family homes, over 300 multi-family units and countless remodeling projects, you can be assured Billman has the expertise, experience and knowledge to complete your construction project with full customer satisfaction. Billman Construction is proud to showcase Hermantown's new development, "Heartwoods Addition" which features 26, side by side Townhomes, maintenance free. If building a new home is in your future, please contact us. We look forward to sitting down with you to listen to all your thoughts and ideas about your new home. We are a "hands on" builder with our client in mind. Give our office a call so we can assist you. Our professional staff will partner with you as you begin turning your dream project into a reality. From a custom deck to special flooring we can create just the look you had in mind.